Microsoft account management page is a central dashboard from which you can change your account settings, clear recent activity for privacy, unlink associated devices with your account and download a backup of all your data. Here is a detailed explanation of the type of data Microsoft collects and uses. In Windows 10, if signed in with a Microsoft account, it can be accessed from Windows Settings > Accounts and then Manage my Microsoft account. There will be different sections for account management like Payment & billing, Devices, Subscriptions and Family. If you have subscribed to other Microsoft services or purchased them before, they can be viewed and managed from Billing & subscription. To set screen time and family controls, you can add a family member right from this dashboard through Family > Add a member. To manage your devices, click on All devices. 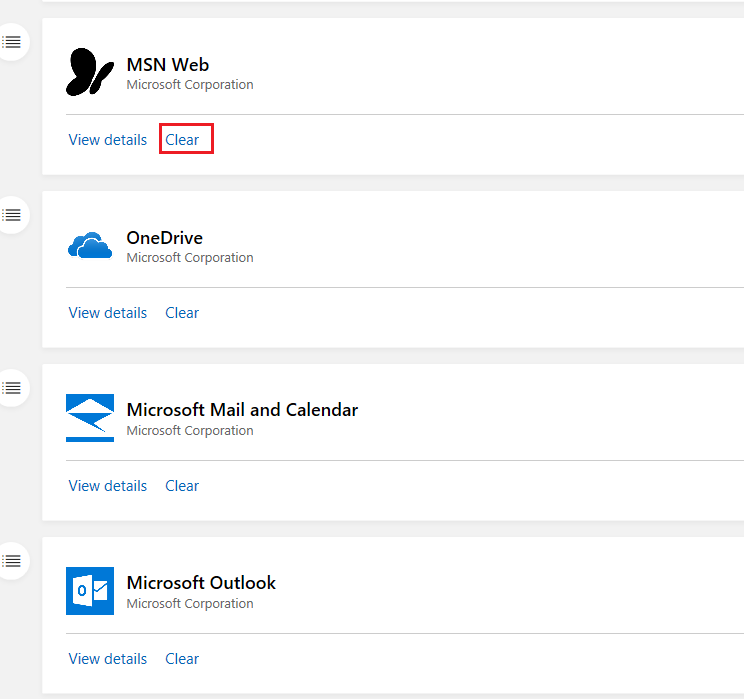 If you are signing in with your Microsoft/ Outlook email to PCs, those will show up here. Other devices like cell phones which are linked to your Microsoft account will also be listed. If you see a PC that is listed but no longer in use, simply remove it from More actions > Remove pc. Also a quick snapshot of system information is also available from Device Info & support. Privacy settings : (You can already disable Timeline from each of your Windows PCs individually). This dashboard shows what information is stored when you use your Microsoft account, to do that click on Activity history. 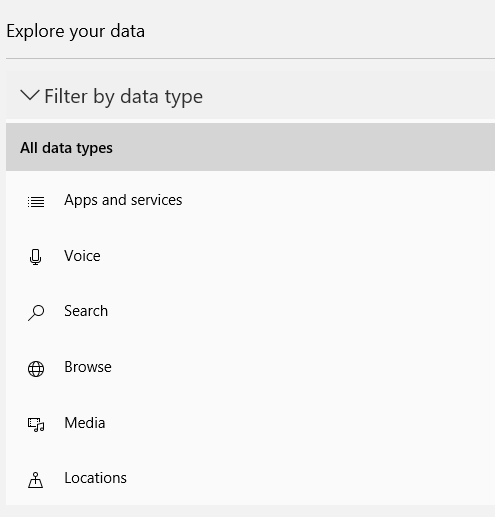 Depending on the various services and apps used like Mail, Calendar and other optionns like location, browsing history (Edge) and so on, the activity section can filter out data that you wish to see and erase. Click on the apps/services and then Clear to erase history. If you have used voice commands for Cortana, those will be available from here to hear and delete from Voice menu. Use the play button next to it to hear and Clear to delete. Other than that, Locations will show Bing maps for your recent locations with the number of recent visits which can be cleared the same way. 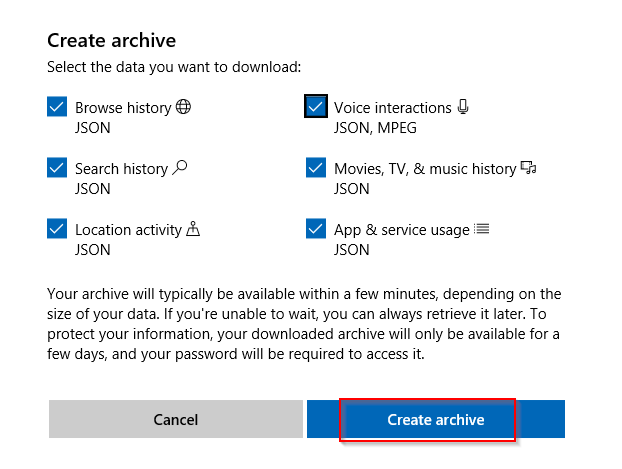 Downloading account data : Click on Download your data > CREATE NEW ARCHIVE for a backup of your account data to be generated. Choose what needs to be backed up as archive and hit Create archive. Depending on the account, it may take a while. The generated backup archive will be available to download for a week from the date of creating the archive. Overall this dashboard provides a clear and granular way of managing your Microsoft account, device and privacy settings all from a unified interface.